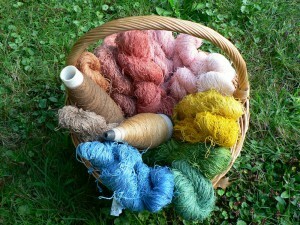 The pink colors at the top come from madder roots, and also the little orange skein on the left. The browns are from black walnut. The light orange in the center is from orange cosmos. The blues are from woad. The greens are from weld with woad on top. The yellows are from weld. This modest-sized basket represents a ton of work, and I am very satisfied!